If you’ve read my post on Tuna Poke, you know how I feel about Hawaiian food. Here’s another island classic that’s traditionally served at luaus as a side dish, alongside kalua pig. It goes great with roast meats, or even other seafood dishes packing a bunch of flavour with each refreshing bite. Traditionally the fresh salmon is rubbed with Alaea salt and left overnight to cure, but for the sake of convenience, I’ve cheated and used gravlax from the grocery store. Since you want the sweetest ripest tomatoes and it’s the middle of winter here in NYC, I used cherry tomatoes in the photo above, but nothing beets a sweet, juicy, vine ripened tomato. Update: It’s worth noting that this is not a traditional lomi as pointed out by Holly in the comments. You’re supposed to use Maui sweet onions and green onions. We don’t get Maui onions here and I like the color from the purple onions so I made that substitution, and chives were what I had on hand so I subbed them in for green onions. As for the citrus, it’s a matter of personal preference, but if you want to go for the real deal, skip the citrus. Add everything except the chives in a bowl and work together with your fingers, breaking up the chunks of salmon as you go. There should be enough salt from the salmon, but add more if it needs it. Looks so easy and good. And you’re right… this brightens up a gloomy day! Looks like a pico de gallo salsa. Do you eat it as a topping or as a salad? 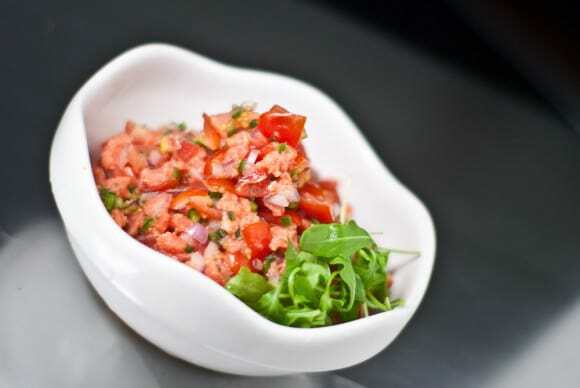 What a great idea to mix the gravlax through the salsa…this screams fresh! It’s a bit like pico de gallo except for the salmon. It’s really more like a condiment than a salad and I had it with roast pork. very nice recipe, im tempted to make this at home! Wow – thanks for this! I love lomi lomi salmon and Hawaiian food in general. I brought home four bags of Alaea salt from Hawaii – it’s sold in regular grocery stores (not gourmet stores) because it’s such an important local food ingredient. Thank you for the recipe! I’ve never had this before but sounds really good! Love the colours too. Great idea. It’s hard to get the authentic kalua pig flavour without an imu and banana leaves, but check out my new post on pandan wrapped roast pork. I would love this on a bagel on Sunday a.m. Hold the cream cheese please. This looks delicious – sounds easy to make. Nice flavours. lomi lomi has been something i’ve wanted to make for awhile. i think people forget that hawaii really has so much personality and flavors and has a very distinct cuisine. i think yours looks fabulous and uber-healthy. did i mention colorful? We’re Pacific Salmon fishing guides and outfitters and tend to eat salmon bellies for supper during the warmer months of Northern California and the Southern Oregon coast. We were delighted to get this Lomi Lomi recipe from a new North Carolina friend. Deee-lish!!! YOU HAVE GREAT RECIPES..LOVE IT. I have been looking for an authentic recipe for Lomi Lomi for a while! Thanks so much. I can’t wait to try this!